Shop in Muscat's unique souks to find the best of Omani goods. Learn about Muscat's rich culture and history. Explore many historic forts and visit museums. See the exciting landscape of wadis, mountains, desert, and canyons. Explore the Wahiba Sands and get a glimpse into the Bedouins way of life. Enjoy the unique Islamic architecture of the Sultan Qaboos Grand Mosque, once the largest mosque in the world. See the highlights of Oman in this ten-day trip. Start the trip by visiting the capital city of Muscat, offering a unique opportunity to witness a modern commercial center existing in harmony with its traditional culture. With its natural harbor, Muscat means “Anchorage” and lies in a natural volcanic bowl. In Muscat, take a tour of the Grand Mosque and the Bait Al Zubair Museum to get a brief introduction that traces Oman’s history and development. Visit the Royal Opera House Musca, a towering beacon shedding light on the various trends of the Renaissance march towards growth. Explore the Bateel date store with an impressive variety of date products on display, chocolate dates, date filled biscuits, dates with nuts and dried fruits, bottled sparkling date juice, date balsamic vinegar and a variety of other items available for purchase. Travel to Nizwa, known as the capital of the interior. This area is the birthplace of Islam in the Sultanate of Oman. Nizwa boasts of the famous Round Tower Fort, built in the 17th century, and its Souq renowned for its Friday cattle auction, intricately hand-carved “Khanjars” (daggers) and ornamental silver jewelry. Spend a day traveling through the Wahiba Sands, a vast mass of undulating red and white sea of sand and dunes rising up to 200 meters. Take in the breathtaking sights of the ever-changing patterns of the dunes. Visit a Bedouin house in this wilderness. Explore the Wadi Bani Khalid, filled with small pretty villages embedded in the mountains. See the Wadi’s beautiful clear blue water. Drive along a quaint fishing village of Quriyat. The drive along the coast offers tantalizing glimpses of the sea. See the Bimah sinkhole, a limestone crater with blue green water at the bottom. Visit the Bahla Fort, which has been declared as a World Heritage site. Explore Jabrin, the finest of Oman’s castles built in the late 17th century became a seat of Omani learning. Admire the pretty village of Birkat Al Mauz situated at the foothills of Jebel Akhdar, the Green Mountains. Enjoy a walk through its oasis and dense date plantations, an ideal choice for those wanting to experience Oman’s scenic beauty. Travel along the Batinah coast and stop at the Seeb Fish Souq by the seaside. Wind through the mountains with small pools of water dotting the Wadi bed. Travel the winding road that leads to Jebel Akhdar, the green jewel of the Al Hajjar mountain ranges, a truly unique spot in the Arabian Peninsula. Enjoy the cool climate up in the mountains. Al Jebel Al Akhdar is famed for its fruit orchards typically laid out terrace style along the slopes of mountains which are endowed with natural springs and aflaj. The village rose of Al Ain dot the landscape. The roses of Jabal Al Akhdar fill the air with fragrance when in full bloom. See the rose water be distilled in the homes of the villagers. Stop at the bustling Muttrah souq, the colorful souq dates at least a century back. Explore the city of Salalah. Visit the Biblical “Nabi Ayoub” Prophet Job’s Tomb, perched high up in the “Jebels” (mountains). En route are spectacular views of the plains, mountain landscape and emerald green pastureland. Proceed to Mughsail Beach where “Blow-holes” – (perforations in the limestone rock) through which sea water gushes during high tide. Experience the Hairpin Bend Roads, the views are breathtaking due to heights involved. At the nearby bird sanctuary, one may see seasonal birds. Enjoy the view of the stark shape of leafless Frankincense Trees that dot the landscape. Once traded as a commodity more precious than gold, frankincense harvested in Dhofar is rated the best in the world. See the ruins of the fabled city of Ubar, chronicled in classical works as the “Atlantis of the sands” are among a series of exciting archaeologists excavations currently underway along the route. Upon arrival into Muscat, be met by a local Yampu representative who will transfer the traveler to the hotel. Visit the Royal Opera House Muscat, a towering beacon shedding light on the various trends of the Renaissance march towards growth. Proceed to Shatti Al Qurum and visit the Omani Heritage Gallery which is a unique outlet through which native artisans can market their goods. A variety of distinctive Omani crafts are available, including Bedouin rugs made with natural dyes, terracotta pottery, basketry, copper pots, silver jewelry, and frankincense from the Dhofari region of Oman. Visit the Bateel date store with an impressive variety of date products on display, chocolate dates, date filled biscuits, dates with nuts and dried fruits, bottled sparkling date juice, date balsamic vinegar and a variety of other items available for purchase. Visit Bait Al Adam Museum and witness the unique collection of currency, paintings, photographs, guns etc. Explore the venue with the owner of the museum and enjoy a coffee with the curator. On the outskirts of Muscat, visit the House of Amouage. At night, go to the Muttrah. Drive along the waterfront corniche and take the first stop at the bustling Muttrah souq. The colorful souq will take you at least a century back. After having enjoyed time at the Souq, have a short walk along the corniche with lots and lots photo opportunities. The "Frankincense burner" is a delight to watch in the night with its full illumination. Proceed for a photo stop to the magnificent Al Alam Palace, official palace of His Majesty Sultan Qaboos flanked by the 16th century Portuguese forts Mirani & Jalali. Head towards Kargeen restaurant for a Delicious Middle Eastern dinner. Don't forget to try the Lemon Mint, which is the highlight of their menu. (No alcohol served) After dinner, transfer back to the hotel at around 2130 Hrs. Depart Muscat and travel to Nizwa, capital of the interior, is the birthplace of Islam in the Sultanate of Oman. Nizwa boasts of the famous Round Tower Fort, built in the 17th century, and its Souq renowned for its Friday cattle auction, intricately hand-carved "Khanjars" (daggers) & ornamental silver jewelry. Drive to the pretty village of Birkat Al Mauz. Enjoy a walk through the lush green date plantations. Proceed to Wadi Al Madeen where there is a check post. From here a 36 km stretch of winding road takes one to Jebel Akhdar (2000 mts above sea level) the green jewel of the Al Hajjar mountain ranges, a truly unique spot in the Arabian Peninsula. Enjoy the cool climate up in the mountains. Al Jebel Al Akhdar is famed for its fruit orchards typically laid out terrace style along the slopes of mountains, which are endowed with natural springs and aflaj. The villages of Saiq, Wadi Bani Habib (the village of the old houses) visit to village rose & Al Ain dot the landscape. The villages overlook a spectacular landscape of dramatic peaks, gorges and wadis. The roses of Jabal Al Akhdar fill the air with fragrance when in full bloom (March / April). Rose water is distilled in the homes of the villagers. Lunch at the Sahab hotel in Jebel Akhdar. After, return to the hotel in Muscat. The Wahiba Sands, a vast mass of undulating red and white sea of sand and dunes rising up to 200 meters are also host to a variety of flora and fauna. The ever-changing patterns of the dunes are a photographer's delight. Visit a Bedouin house in this wilderness. In stark contrast to this is Wadi Bani Khalid. It comprises of small pretty villages embedded in the mountains. The Wadi has clear deep blue water. After, return to the hotel in Muscat. This tour provides many interesting contrasts. Proceed towards the fishing town of Quriyat through the stark mountain terrain. Drive through the fishing village of Quriyat along the picturesque waterfront. There is a good chance of spotting Flamingos and Eagles at an inland stream. From here proceed towards the coast and visit the spectacular Bimah sinkhole which is a limestone crater with blue green water at the bottom. Then start on an adventurous route cutting through the mountains. At the end of the drive, Wadi Arbayeen awaits with its deep pools of water set among the date palms. Enjoy a picnic lunch here. Drive back via Wadi Mazara visiting the Wadi Dayqah Dam. After, return to the hotel in Muscat. Take a flight from Muscat to Salalah. Visit the fishing village of Taqa, an old town with an interesting castle surrounded by watchtowers and Taqa stone houses. Proceed onward to Khor Rori creek, the site of the ruined city of Samhuram and capital of ancient Arabia's frankincense trade. Excavations have produced evidence of an ancient city with trade links by sea to Far Eastern destinations and with even distant Greece. Mirbat, the ancient capital of Dhofar, was an important town as early as the 9th century for its trade in frankincense, horses and slaves. See some of the old houses famous for its woodcarvings. If lucky see boatloads of fish arriving into the harbor. One of Dhofar's best-known historic sites is Bin Ali's Tomb. The twin domed structure; tomb of Mohamed bin Ali who died in 1135 AD is a fine example of medieval architecture. Return via Ayn Razat, manicured gardens fed by natural underground springs. Proceed on a full day to UBAR. The ruins of the fabled city of Ubar, chronicled in classical works as the "Atlantis of the sands" are among a series of exciting archaeologists excavations currently underway along the route. In the Rub-Al Khali (The Empty Quarter) area we experience dune driving before returning to the hotel. At the appropriate time be met at the hotel to transfer back to the Salalah airport for departing flight. Muscat is the capital and largest city of Oman. The city of Muscat is the combination of three smaller towns that have blended together over time. There are three distinct sections of the city because of this. What used to be the smaller town of Muscat, referred to as “the walled city”, was home to the royal palaces. Matrah was a fishing village. Ruwi was and still is the commercial and diplomatic center of the city. Salalah, sometimes referred to as the “second city of Oman”, is located in the southern part of Oman. Salalah belongs to the region of Dhofar, best known for its frankincense trade. There are also many mountain tribes in the area. The old part of the city Haffa, is famous for its souqs. The Best Western Premier Muscat opened its doors in the summer of 2012, a 4 star non-licensed business hotel located in the commercial district of Al Khuwair, right next door to the embassies and government ministries. The modern design and white refreshing lobby is enhanced with an atrium and an indoor swimming pool on the ground floor. The hotel features 203 contemporary designed bedrooms and suites, the majority of them being the superior room with 28 square meters featuring either king bed of 180 square centimeters or two large twin beds of 120 square centimeters, a 42 inch LED flat screen television with a variety of satellite channels, coffee /tea tray, mini-bar with soft drinks/snacks, a personal safe and a shower only bathroom with rain shower. The premier floor is our executive floor; the bedrooms and suites include enhanced amenities and guest services including the Premier Lounge and Terrace serving light snacks, teas, coffees and soft drinks throughout the day. The hotel has two restaurants – The Atrium, an all day dining restaurant serving Arabic and International cuisine and buffet, and the Mashawi Grill – our grill house serving the best of dishes from the Middle East, the Mediterranean and the America’s. Also in the lobby we have the Connection Cafe – try our delicious cappuccino and fresh fruit juices with complimentary (for residents only) use of our two computers and internet. For your corporate events we have four function rooms accommodating from 15 to 150, for training seminars, business meetings or that private dinner. And not forgetting the fitness minded, along with the indoor swimming pool we have the fitness room and sauna. 24 hours a day, ibis Muscat welcomes travelers to the city of Muscat, nestled between mountains and sea. Conveniently situated in the Al Khuwair area, near the Ministries district, the hotel is just 8 km from Seeb International Airport and offers free underground parking for all guests. Every room features Sweet Bed by ibis and free WiFi, so you’ll awake refreshed and ready to shop 150 global brands at the nearby Grand Mall, explore the endless beaches, or visit the spectacular Opera House. Ibis Muscat guests maintain top productivity in the Business Centre and stay in shape in the well-equipped gym. Snacks are available around the clock, breakfast is served from 4 AM to noon and the casual restaurant prepares tasty meals until 11 PM. The luxury desert resort only an hour and a quarter drive from Muscat International Airport and the bustling city of Muscat, you will discover a magical world where time stands still. Welcome to Dunes by Al Nahda, the closest desert resort to Muscat and the United Arab Emirates! In Wadi Al Abiyad (White Sands in Arabic) sand dunes, and nestled atop one of the tallest, Dunes by Al Nahda is an intimate, luxury boutique desert resort offering unrivaled views over the surrounding undulating dunes and mountains in the background. Come share our views and experience whilst discovering a luxury adventure. Come discover the Magic. Dunes by Al Nahda features a total of 50 ultra-luxury accommodation guest bedroom tents, distributed in 30 guest tents, each featuring, amongst others, full en-suite bathrooms, separate seating areas and individually controlled air-conditioning. Our open air restaurant, Fleur, gives guests the opportunity to dine al fresco and enjoy a full desert experience. Treat yourself to a rich breakfast with the family, a re-energizing lunch after dune bashing or a romantic dinner for two, all with unparalleled views in Oman. It is also the perfect setting for a drink at sunset and partaking of the striking to soft hues of the light and color as the sun disappears under the horizon. Jump start your stay with quad biking to then relax in the unique experience of a sand spa. Build a sand castle with your children or fly a kite in the crisp blue skies with the help of the soft desert breeze; settle in with a good book from our library or enjoy a film on your flat screen in-room LED TV. After an exhilarating, adrenaline rush filled day dune bashing, gliding down the dunes on one of our sand boards or playing a round of golf on our exclusive and on-site 09 hole bunker golf course, you deserve to enjoy your comfortable bed and cloud soft sheets. For your office or social events , Dunes by Al Nahda also features a natural light formal banquet facility which is divisible in 2 and can take a maximum capacity of up to 160 people. Dunes by Al Nahda, the dunes at your doorstep! Ruwi Hotel is a popular choice amongst travelers in Muscat, whether exploring or just passing through. The hotel offers a wide range of amenities and perks to ensure guests have a great time. Free Wi-Fi in all rooms, facilities for disabled guests, Wi-Fi in public areas, available parking, and room service are a few of the many amenities we have here for our guests to enjoy. All rooms are designed and decorated to make guests feel right at home, and most rooms come with television LCD/plasma screens, internet access – wireless (complimentary), air conditioning, wake-up service, and are non-smoking. To enhance guests’ stay, the hotel offers recreational facilities such as a fitness center, sauna, outdoor pool, massage, and squash courts. For reliable service and professional staff, Ruwi Hotel caters to your needs. Tulip Inn Muscat the newest hotel in the area Located in the heart of Al Khuwair district welcomes you and your family in a truly relaxed atmosphere. Whether you are for leisure or business, the hotel is ideally located with easy access to Ice skating rink, Muscat Opera House and to all ministries. IntercityHotel Salalah is located in the center of business district in Salalah with close proximity to all government institutions and shopping centers. IntercityHotel Salalah offers simple yet modern and fully air-conditioned accommodations, free WiFi, a fitness center, roof top swimming pool & steam room, Al Luban all-day dining and Taqa lobby lounge & cafe and two meeting rooms. Furthermore, you have free access to the beach. All rooms are stylish and equipped with spacious wardrobe, attached bathroom, LED TVs with international and local channels, tea/coffee making, spacious working desk with high-speed internet, mini-bar and electronic safe. Khareef Festive Area is just a 5-minute drive away and Airport & Public Beach is 15 minutes away by car. Our service sets us apart. As the new luxury hotel collection in the world, the (Safir Hotels & Resort Worldwide) Salalah Gardens Hotel name is associated with the highest standards of luxury and impeccable personal service. This cherished tradition can be felt throughout the 85,000 square meters. 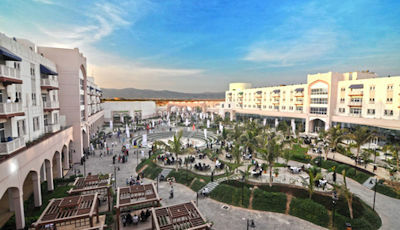 Salalah Gardens Hotel, which opened in June 2013, as the first property of the Safir hotel chain in the city of Salalah. With its suitable location inside Salalah Gardens Mall, the hotel offers convenience to both business and leisure guests in form of world-class shopping, dining, and entertainment. The mall itself includes more than 150 stores selling prestigious labels, a 14-screen multiplex cinema and numerous food and beverage outlets – and not to mention the 1st biggest mall in town. During more serene hours, guests can rejuvenate at our brand new health club or simply sit back and relax by the outdoor infinity edge pool. In short, limitless possibilities are offered here and there is something for everyone to enjoy. Now imagine the most wonderful of all holidays and we will make it happen. Our head concierge and his team are here to answer your requests and make sure that your stay will become a memorable one. Al Falaj Hotel Muscat is conveniently located in the heart of the city with easy access to both the business district as well as tourist attractions. The Muscat hotel is a pleasant 35 km drive from the Muscat International Airport. Among Muscat best hotels, Al Falaj is the finest business hotel Oman has to offer, Al Falaj Hotel is an ideal meeting point for business or for pleasure. The hotel is managed by the Aitken Spence Hotels portfolio and offers everything a traveler needs – exotic cuisine, conference facilities that are the best the city has to offer, courteous staff and a choice of recreational activities that will help you to unwind. City Seasons Hotel Muscat redefines the business hotel category in Muscat, combining unparalleled luxury with contemporary elegance and comfort. Located on Al Sultan Qaboos Street, City Seasons Muscat is in the heart of the Capital’s diplomatic and commercial district and is an actual milestone to the country’s business accomplishments. Check into an elegant seaside hotel in Oman’s thriving capital with a private beach and easy access to local businesses. The dazzling Crowne Plaza® Muscat hotel looks out across the turquoise waters of the Gulf of Oman from a lush clifftop in fashionable Qurum Heights. With a panoramic terrace, pool and private beach, the hotel is just a 20-minute drive from Muscat International Airport and steps from Qurum Beach with its cafe-lined promenade. Oman’s main business and ministerial districts are 10 minutes away. Families and couples can sunbathe on the private beach and swim in a pool set in leafy gardens alive with bougainvillea and date palms. After exploring ancient Muttrah Souq and Corniche, you can savor a cool drink in our English-style Dukes Bar as the sun dips into the Gulf. For dinner, how about Italian, Persian, or lavish buffets on the terrace of Tropicana with stunning sea views? Business travelers enjoy the hotel’s relaxed vibe and convenient services such as complimentary Wi-Fi and parking, 24-hour room service and a Concierge who can pre-arrange taxi fares. After work, you can re-energize in the Cliff Club Fitness Center, challenge colleagues to a game of tennis or squash and de-stress in the sauna or steam room with our compliments. With 200 stylish rooms and a convenient, prestigious location in Oman, you’ll find Crowne Plaza Muscat an ideal hotel for productive business and enjoyable leisure time. The Golden Tulip Seeb is just 2 km. from Muscat International Airport and is adjacent to the Oman International Exhibition Centre. It is also a few minutes drive from Muscat City Center and ideally located for all internal tours. From full-service hotels to long-stay suites, relaxing resorts to state-of-the art meeting facilities, Golden Tulip hotels offer an excellent accommodation in a setting that’s always different, but never foreign. We are proud to announce the Soft Opening of Grand Millennium Muscat with an initial launch of deluxe guest rooms, dining options and leisure facilities available. There is much more to come and we look forward to launching all hotel facilities over the coming months. Centrally located in the business, government, and diplomatic district, with direct access to Muscat Grand Mall, Grand Millennium Muscat Oman is uniquely convenient. Our 296 rooms and suites, and 32 spacious apartments, are all luxuriously appointed with everything you need. At our Taybat Restaurant and rejuvenating spa, you can indulge all of your senses. And if you’re here for business, our range of meeting rooms, Executive Lounge with panoramic views of the city, and location 15-mins from the airport will ensure a productive time. Stay with us for a complete Muscat experience. A contemporary, business-friendly airport hotel in thriving Muscat. For a successful business or leisure trip to Oman’s picturesque capital, the Holiday Inn Muscat Al Seeb places you where you need to be. It’s just an eight-minute drive from Muscat International Airport to the hotel’s stylish lobby, where guests find a warm welcome and a relaxing vibe. The Hotel Muscat Holiday is located in Al Khuwair within the capital area of Muscat, Oman, conveniently situated on the midway between Muscat International Airport and the central business district. Our friendly service is not about reacting but anticipating our guest needs, an exclusive Pillow Menu of 5 choices that creates the ideal restful environment, our delicious breakfast tailored to suit one person – you! Centrally located in the Al Khuwair area, and close to the Ministries district, Millennium Executive Apartments Muscat is a part of Tilal Complex -Muscat’s new mix use development for Retail, upscale dining, luxurious living and Hi-Tech offices. Additionally, Millennium Executive Apartments, Muscat is located within walking distance of The Avenues Mall, with more than 205 retail outlets and a 20,000 sqm hypermarket. Our 115 spacious apartments have all you need for a restful stay, including WiFi, an open plan lounge and dining room, and master bedroom ensuite. Our German-designed kitchens are also efficient and elegant, and come with a full range of utensils.Dine or meet friends at our stylish Cafe M, or keep fit in the gym and pool. Business travelers will also appreciate our multi-functional meeting rooms and state-of-the-art facilities. With Millennium Executive Apartments Muscat, you’re sure to enjoy a perfect stay. You’ll be pleasantly surprised at this hotel’s central location in Muscat near shopping areas, ministries, embassies and historic buildings. Take a break from sightseeing or your busy meeting schedule and stroll Al Ghubra Beach or the gardens at Sultan Qaboos Grand Mosque. After a full day, stay in for the evening and enjoy this Oman hotel’s many amenities, including the rooftop swimming pool, fitness center and selection of restaurants and bars. Organize smart meetings and other special events in our 5 flexible, modern venues. Located downtown near the central business district and prime shopping, the Radisson Blu Hotel, Muscat positions guests for productive business visits and relaxing vacations. Our 4-star hotel has a convenient location, just 15 kilometers from Muscat International Airport, where guests can enjoy the bustle and culture of this capital city as well as the beauty of nearby mountains and beaches along the Gulf of Oman. Choose from 153 comfortable rooms and suites with modern amenities like individual climate control and free high-speed, wireless Internet. The hotel’s 4 restaurants and 2 bars offer a wide variety of cuisine and atmospheres, including fine Italian dining and an Irish pub. Visit our health club for an energizing workout, or unwind with a swim in the outdoor, temperature-controlled pool. Thanks to our location in the nation’s diplomatic and commercial center, the hotel plays host to numerous business events throughout the year. Its 5 meeting rooms and garden space are also available for personal events. Ramada Muscat an international 4-star hotel, is strategically located in the heart of Muscat’s diplomatic district within a couple of minutes away from the beautiful Qurum beach & just 20 minutes from the Muscat International airport. With our top class amenities and our spacious rooms will fulfill your business & Leisure traveler’s every need including 24-hour room service, free broadband wireless internet and much more. The Ramada Muscat Hotel is the perfect location for a successful business trip or a pleasurable and relaxing holiday. Set where east meets west, a new kind of luxury rich in culture overlooking the Muscat mountains exceeds the expectations of the modern traveler. The iconic design is characterized by rolling landscapes, celebrating the influences of western and eastern culture. Sublime comfort meets sophisticated style. With unique features and stand out touches in all 231 guest rooms and suites overlooking the valleys and mountains, including the luxury details every traveler desires. Start your journey at The Hub with the delicious in-house bakery or dine exquisitely on Northern Indian cuisine at Qureshi Bab-Al-Hind. Experience true indulgence from Thailand with the relaxation of iSpa. Enjoy the splendor and exquisite backdrop of the Zaiba ballroom for impressive events and an uncompromising selection of boardrooms catering to your every need. Seamless service and attention to the smallest of details create a sensational experience, especially for you. The Platinum, a newly opened ( non-licensed) hotel officially categorized as a “FOUR STAR HOTEL”, depicts a fusion of rich Islamic & Mogul heritage with ultra modern and state-of-the-art facilities with famed Omani culture, is all set to redefine hospitality in the Sultanate of Oman. The architecturally majestic structure is now a prominent landmark in Muscat, built with the rich handcrafted pink stone brought specially from Jodhpur, India, gives it the regal look of the Emperor’s era. The refined taste and an eye for designing details are visible in every aspect of the hotel, beginning from its impressive external elevation itself. Nestled on the picturesque marina promenade of Salalah Beach, a popular destination for tourists who are attracted by its incredible climate and vistas. Elegant and understated, the 4-star Juweira Boutique Hotel was designed in a classic oriental theme. Creative dining, best escape to nature, quite place with great comfort and service, close to the Salalah town. Located on the beach front and with a view of the Hajjar Mountains, this five-star resort is located in the heart of the city’s residential, government and diplomatic quarter. The hotel’s Palm Beach Club offers two floodlit tennis courts, a 25-metre Olympic size pool, a leisure pool, a fully equipped fitness center, sauna, jacuzzi, and easy access to the beach. Local sites of interest include the Grand Mosque and Amouage Perfume Factory. Al Bustan Palace, a Ritz-Carlton Hotel is set in exquisite gardens between the dramatic Hajar Mountains and shimmering sea. The hotel’s journey since opening in 1985 is one of stateliness and grandeur, while reflecting Omani culture, and traditions. Tucked away between the rugged Al Hajar mountain range and the Sea of Oman, Al Bustan Palace, A Ritz-Carlton Hotel is a hidden jewel amongst luxury hotels in Muscat, Oman, a beachfront retreat that welcomes guests with customs steeped in ancient traditions and contemporary comfort. From each of our luxury Muscat hotel’s 250 guest rooms and suites’ private balconies, guests can gaze upon magnificent mountain, sea or garden views. They can relax on the pristine stretch of private beach or dine on its sandy carpet under the stars, in one of our Muscat hotel’s three distinctive restaurants. Perfect for couples, business guests and families alike, Al Bustan Palace provides all the ingredients that will stir memories for a lifetime. Where the majestic Al Hajar Mountains meet their luminous reflection in the serene waters of the Gulf of Oman, The Chedi Muscat rises amidst an elegantly landscaped twenty-one acre garden oasis with 158 Omani influenced guestrooms and villas. This sublime yet central location equally suits leisure and business travelers while six distinct restaurants, a thirteen-suite Balinese spa, three swimming pools, including the 103-meter Long Pool, 700-square-meter health club plus two executive meeting rooms enhance Muscat’s considerable cultural attractions. Travel to Oman where “Beauty has an Address” and stay in one of Muscat’s hotels. Grand Hyatt is a 5 star hotel in Muscat situated on a pristine stretch of beach in the capital of the Sultanate of Oman and is a striking illustration of Arabian architecture. Sited in the heart of the Embassy and Ministry district of the city in Shatti Al Qurm, majestic surroundings and traditional Omani hospitality combine for a truly unforgettable stay. The white, sandy stretch of Shatti Al Qurum beach is situated directly outside Grand Hyatt Muscat hotel. This public beach on the Gulf of Oman is lined with palm trees and has jogging paths, walkways and picnic areas located beside it. Grand Hyatt Muscat is perfect for both business and leisure pursuits. For a weekend in Muscat or if you’re staying longer, it is one of the largest and most opulent luxury hotels Muscat has to offer, with 280 stylishly appointed hotel rooms & suites, with a remarkable Arabian style interior design. The property has outstanding recreational facilities and numerous meeting and event spaces for up to 1000 people, which cater to a wide range of events and business requirements. Our luxury hotel in Oman offers wedding packages and special offers according to the needs of our guests and the season. Guests have the option to choose from a variety of award-winning restaurants, bars and lounges including Tuscany, Grand Hyatt Muscat’s signature Italian restaurant, and the Safari Rooftop Grill House. Taking advantage of our fitness center Club Olympus, guests can enjoy healthy and relaxing moments in the temperature controlled swimming pool, the whirlpool bath or playing tennis in one of our courts. Visitors can enjoy numerous activities nearby at our luxury hotel in Muscat. These include Golf, visiting the Sultan Qaboos Grand Mosque, the Mutrah Souq, Muscat Old Town, the Mutrah Corniche, the National Museum, or the Bait Zubair Museum which are all located in the surrounding area of this five-star hotel. Our hotel also guarantees all the luxury guest services to its visitors, such as airport transfer, parking for more than 300 cars and Internet access and business services. Al Bandar is one of the three hotels at Shangri-La’s Barr Al Jissah Resort and Spa, Sultanate of Oman. The five-star deluxe property provides 198 sea-facing guestrooms. The name Al Bandar translates as “The Town”, a name reflected in the architecture of the hotel. Inspired by old Muscat, featuring buildings of varying heights and a variety of ornate balconies, Al Bandar is an inspiration. Al Bandar Hotel is the resort’s focal point, featuring seven food and beverage outlets and 11 meeting rooms, as well as the spectacular Barr Al Jissah Ballroom measuring 1,056 square meters and providing banquet-style seating for up to 700 people. Built in 1985 and completely renovated in 2016, the Sheraton Oman Hotel is a landmark in the city of Muscat and has been a synonym for 5-star hospitality for over 3 decades. Located on top of Ruwi, the financial and business district of Muscat, the hotel is the tallest building in the city and has long been part of the social fabric of the local community. Welcome to the luxurious Salalah Rotana Resort in Oman where you will be embraced by the traditional warm and friendly Omani hospitality. Set along the shores of the Indian Ocean, Salalah Rotana Resort is a scenic 20km drive from Salalah Airport. The waterfront resort’s 400 splendid rooms and suites are beautifully built around the lagoons, water features and man-made canals for an unforgettable experience. In-room furnishings including beds, tables, and sofas have been integrated into the main walls with Arabesque geometric designs constructed using traditional techniques. Take a culinary journey in any of our four dining venues. Whether you want to enjoy a cocktail at the beach, have a tea in our lobby lounge or looking for an informal All Day Dining, your needs will be satisfied. The conference area features four fully equipped and flexible meeting rooms with the latest audio-visual equipment and the stunning Al Hajar Ballroom making Salalah Rotana Resort the ideal destination for leisure and business travelers. With its state-of-the-art facilities, guests can keep fit at Bodylines Fitness & Wellness Club, take a dip in the swimming pool or relax and rejuvenate at Zen the spa at Rotana. Discover Salalah during the Khareef (Monsoon) season and experience its misty rain and cooler temperatures. Due to the strong winds and waves, beach access is prohibited until the end of the Khareef season. To discover more about the Khareef season, please visit Rotana Times. Recline on our well-lit beach and by the pool with sumptuous cuisine at the relaxing Crowne Plaza Resort Salalah. Receive a warm welcome from friendly Omani staff as you cross 42 acres of lush, landscaped gardens and enter into the gleaming Lobby of Crowne Plaza Resort Salalah. We’ll show you to your room or Suite, or point you towards our 3 interconnecting pools, tennis and squash courts or par-3 garden golf course. A courtesy shuttle bus whisks you from Salalah International Airport to Crowne Plaza Resort Salalah in 25 minutes. We combine a resort getaway with easy access to the center of Salalah, just 10 minutes’ drive away. Lush hotel gardens lead to the gentle turquoise waters, lapping against the beach. Locals are drawn to our night-time attractions, from sumptuous themed buffets with Arabic Music on the white sand at Dolphin Beach Restaurant and disco nights at Al-Luban nightclub on weekends. Al-Khareef Pub, with its rich wood and stained glass, is a homely space serving draught beers. Dine al fresco on the Arabic-style terrace of Darbat restaurant or sip cocktails at the Pool Bar. You can sit back and relax at Crowne Plaza Resort Salalah. From our dedicated children’s entertainment team to the Crowne Meetings Director who’ll help organize banquets and conferences, we’ll take care of all the details. Stay at Hilton Salalah Resort for beautiful views out your window and entertainment at your doorstep. Whether you’re at our pool, dining at one of our five restaurants or using one of our event spaces, you’ll have the perfect view of the beach. We’ll help you get to and from the Salalah International Airport, only a 15-minute drive via the hotel shuttle service. This luxury beach resort near Salalah and in the heart of the scenic Dhofar region of Oman is the perfect retreat. The Mirbat Marriott Resort is a 40 minutes scenic drive from Salalah International Airport via hotel’s complimentary shuttle service. The 5-star nearby Salalah hotel offers 237 beachfront luxury rooms the perfect accommodation choice to kick back and indulge in a relaxed family vacation, group holiday, couples romantic retreat, diving trip or weekend gateway. Situated on Mirbat beach, the resort is an ideal retreat for anyone seeking exclusive surroundings, tranquility and ultimate privacy. Facilities include four excellent restaurants, a bar, a fabulous outdoor swimming pool with swim-up bar and Health Club and Spa. Discover the lush greenery of Wadi Darbat during Khareef season, magnificent sand dunes and local ancient Mirbat forts of the Dhofar region. Located on the beach front and with a view of the Hajar Mountains, this five-star resort is located in the heart of the city’s residential, government and diplomatic quarter. The hotel’s Palm Beach Club offers two floodlit tennis courts, a 25-meter Olympic size pool, a leisure pool, a fully equipped fitness center, sauna, jacuzzi and easy access to the beach. Local sites of interest include the Grand Mosque and Amouage Perfume Factory. Al Bustan Palace, a Ritz-Carlton Hotel is set in exquisite gardens between the dramatic Hajar Mountains and shimmering sea. The hotel’s journey since opening in 1985 is one of stateliness and grandeur while reflecting Omani culture, and traditions. Tucked away between the rugged Al Hajar mountain range and the Sea of Oman, Al Bustan Palace, A Ritz-Carlton Hotel is a hidden jewel amongst luxury hotels in Muscat, Oman, a beachfront retreat that welcomes guests with customs steeped in ancient traditions and contemporary comfort. From each of our luxury Muscat hotel’s 250 guestrooms and suites’ private balconies, guests can gaze upon magnificent mountain, sea or garden views. They can relax on the pristine stretch of private beach or dine on its sandy carpet under the stars, in one of our Muscat hotel’s three distinctive restaurants. Perfect for couples, business guests and families alike, Al Bustan Palace provides all the ingredients that will stir memories for a lifetime. Travel to Oman where “Beauty has an Address” and stay in one of Muscat’s hotels. Grand Hyatt is a 5-star hotel in Muscat situated on a pristine stretch of beach in the capital of the Sultanate of Oman and is a striking illustration of Arabian architecture. Sited in the heart of the Embassy and Ministry district of the city in Shatti Al Qurm, majestic surroundings and traditional Omani hospitality combine for a truly unforgettable stay. The white, sandy stretch of Shatti Al Qurum beach is situated directly outside Grand Hyatt Muscat hotel. This public beach on the Gulf of Oman is lined with palm trees and has jogging paths, walkways and picnic areas located beside it. Grand Hyatt Muscat is perfect for both business and leisure pursuits. For a weekend in Muscat or if you’re staying longer, it is one of the largest and most opulent luxury hotels Muscat has to offer, with 280 stylishly appointed hotel rooms & suites, with a remarkable Arabian style interior design. The property has outstanding recreational facilities and numerous meeting and event spaces for up to 1000 people, which cater to a wide range of events and business requirements. Our luxury hotel in Oman offers wedding packages and special offers according to the needs of our guests and the season. Guests have the option to choose from a variety of award-winning restaurants, bars and lounges including Tuscany, Grand Hyatt Muscat’s signature Italian restaurant, and the Safari Rooftop Grill House. Taking advantage of our fitness center Club Olympus, guests can enjoy healthy and relaxing moments in the temperature controlled swimming pool, the whirlpool bath or playing tennis in one of our courts. Visitors can enjoy numerous activities nearby at our luxury hotel in Muscat. These include Golf, visiting the Sultan Qaboos Grand Mosque, the Mutrah Souq, Muscat Old Town, the Mutrah Corniche, the National Museum, or the Bait Zubair Museum which are all located in the surrounding area of this five-star hotel. Our hotel also guarantees all the luxury guest services to its visitors, such as airport transfer, parking for more than 300 cars and Internet access and business services. Between a beach and freshwater lagoon, Al Baleed Resort Salalah by Anantara offers refreshing luxury, and also a gateway to Oman’s cultural treasures. Experience a beachfront oasis that is the first luxury villa resort of its kind in Salalah, along the south coast of Dhofar. Admire how history, culture, and nature unite in striking elegance to honor the destination. Middle Eastern design reflects Dhofar’s rich heritage and is inspired by the region’s iconic coastal fortresses. Intricate, artistic details complement the princely comforts, unparalleled amongst Salalah hotels. Walkways are surrounded by towering palms, magnificent trees, tropical gardens and lush water features, creating tranquil journeys to new discoveries. Relax at the exotic infinity pool, or soak up the sea view from our private shore. Ancient spa rituals performed by highly skilled therapists await you in Salalah’s first hammam. Children’s and teens’ clubs engage younger guests with their own pool, creative activities and local adventures. Culinary experiences immerse you in the Middle East’s exquisite tastes and take curious diners on scintillating journeys. Sip refreshments and savor marinated barbecue dishes at the Mediterranean beach bar. Gourmet world flavors are yours to enjoy all day. For dinner, let us tempt you with Asian specialties from countries that border the Mekong River. Just a stroll away, the Al Baleed Archaeological Park invites you to step back in time – explore a UNESCO World Heritage Site of citadel and grand mosque ruins, and arouse your senses in the Museum of Frankincense.